NOTE: IVN classrooms may change without notice. Check this page before attending your first class session. 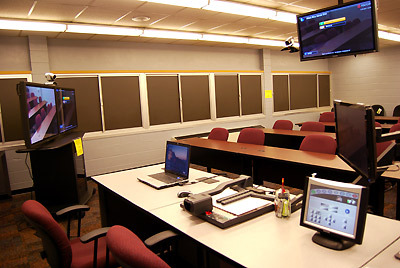 Register for all Minot State University (MiSU) Interactive Video Network/Video Conferencing classes via CampusConnection.For specific registration information, please contact the Center for Extended Learning at 701-858-3822 or toll free 1-800-777-0750. To register for IVN classes at another North Dakota University System school, contact Jolina Miller, MSU Collaborative Student Representative, at 701-858-3218 or contact the host institution. Admitted graduate education students may register for the graduate courses listed below via CampusConnection. If you are not currently an accepted MSU graduate student but would like to enroll as a non-degree student, please contact the MSU Graduate School at 701-858-3250 or toll free 1-800-777-0750 ext. 3250 for information. For specific IVN/Video Conferencing questions, contact Carla Davis at 701- 858-3984. Our IVN studies in the Administration Building are served by an elevator on the west end of building, near the first floor bookstore. IVN classrooms are wheelchair accessible. Other accommodations in seating can be made upon request.